Light Field is a beacon for an emerging Downtown Indianapolis and a new model for sustainability and interaction. The design is inspired by Indiana’s agricultural landscape, by its simplicity, beauty, and magnitude. It is low, open, and transparent to reveal the CCB’s entrance and the six pillars to the surrounding city. Across a gently sloping landscape, a field of lights is arranged in a pattern that recalls Indiana’s agricultural grids. From this pattern, all the Plaza elements emerge. A Grove is planted with native trees that blossom in varying seasonal colors. 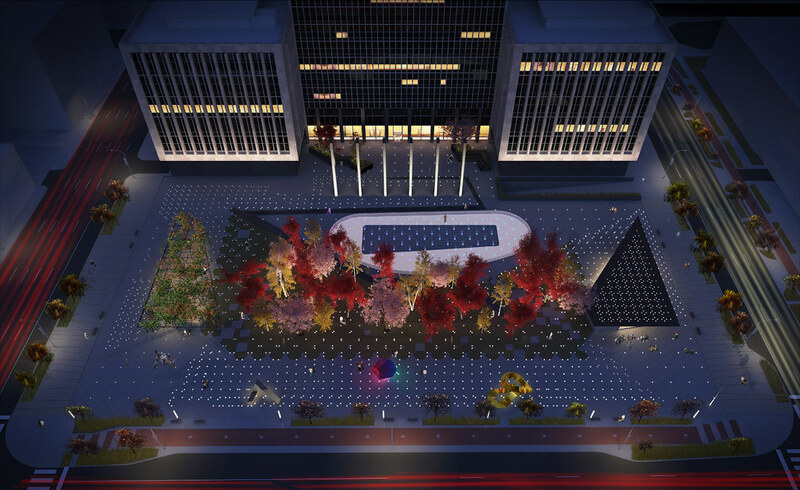 A Fountain Plaza is revealed with a splash fountain that transforms into an ice rink during the winter. A new pedestal is created around the six pillars to underscore their symbolic importance. Street life animates every edge of the site. An Art Walk to the south with large-scale public art adds a new dimension to the Cultural Trail. Finally, Food Truck and Market Kiosk Pavilions give life to the east and west sides of the plaza.